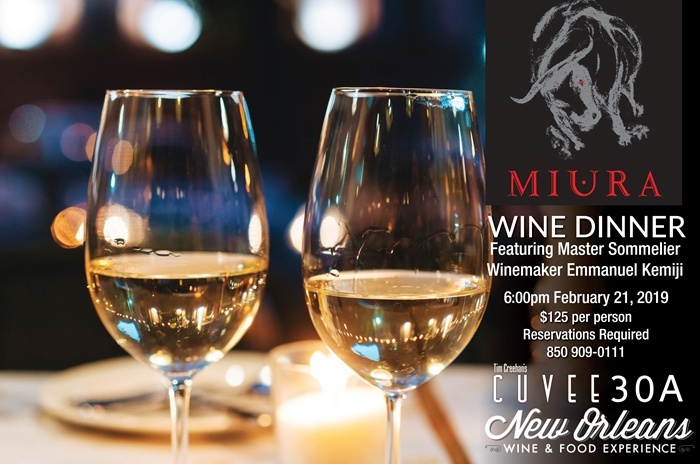 You’re invited to a special event as New Orleans Wine & Food Experience and Cuvee 30A present the Miura Wine Dinner, hosted by Master Sommelier and Miura Winemaker Emmanuel Kemiji’s fine vintages paired with a specially selected 5 course menu of FRLA Restaurateur of the Year Chef Tim Creehan’s incredible cuisine. Event starts 6 pm on Thursday, February 21 2019. $125 per person, limited seating, reservations required. Please call 850-909-0111 to book your spot. See the menu and more at Cuvee30A.com/WineDinner.